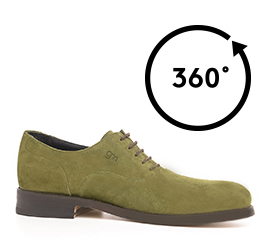 Elevator Oxford shoe with upper in green suede calfskin. An elegant velvety effect on a classic shoe with inner elevator system to choose from 2.4 up to 3.1 inches, made even more exclusive by the fine Goodyear stitching. It is possible to customize the shoe by engraving, also on precious metals, the first and last name or just the initials on the leather outsole.